It is estimated that nationally about one third of households with children ages 17 and under have a gun in the home. 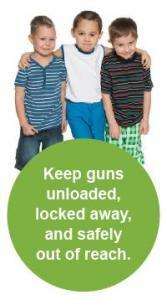 Parents need to take extra precautions when children are in an environment where guns are present. Explain how a gun your kids might see on television or a video game is different from a gun in real life.